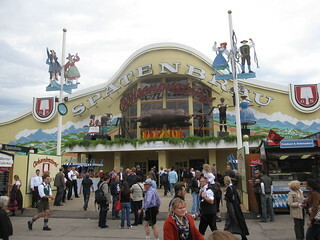 Entrance to the Spatenbräu Festhalle on the Wiesen at Oktoberfest 2012. Spatenbräu Festhalle is also known as Ochsenbraterei because of the original steam rotisserie that was designed and put to use as long ago as 1881, it holds a whole ox! Little has changed today other than electricity having replaced the original engine. It takes about 6 or 7 hours to grill an ox which can turn out around 700 portions of meat. During the 2012 Oktoberfest, 116 oxen were grilled.